Looking for Assistant Professor jobs in B.Ed Colleges 2019 in Tamilnadu? or Searching for Faculty Teachers Tamil Nadu Feb 20019? 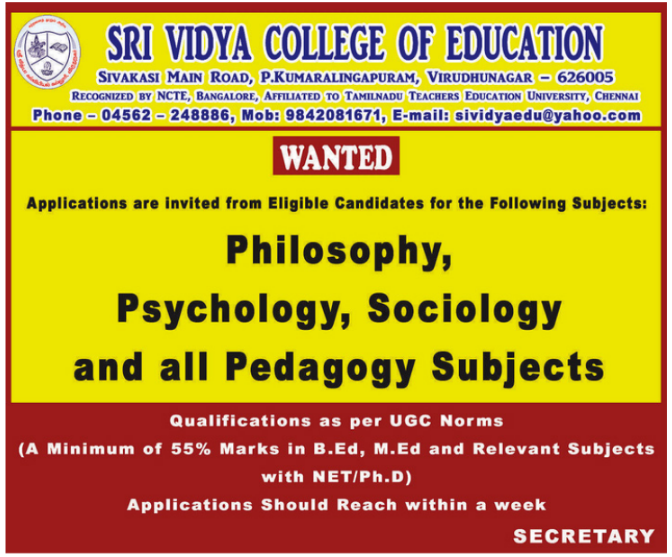 A college based in Virudhunagar named Sri Vidya College of Education, Virudhunagar has advertised in the DINAMALAR newspaper for recruitment of Assistant Professor jobs vacancies. Interested and eligible job aspirants are requested to apply within 07 days from 03rd February 2019. Check out further more details below. About College: Sri Vidya college of Education has been established in the year 2007 by Sri Vidya Educational & Charitable Trust. The founder Trustee Thiru.R.THIRUVENGADA RAMANUJA DOSS,. is the Chairman of the college who is a retired Chief Engineer OF TNEB.